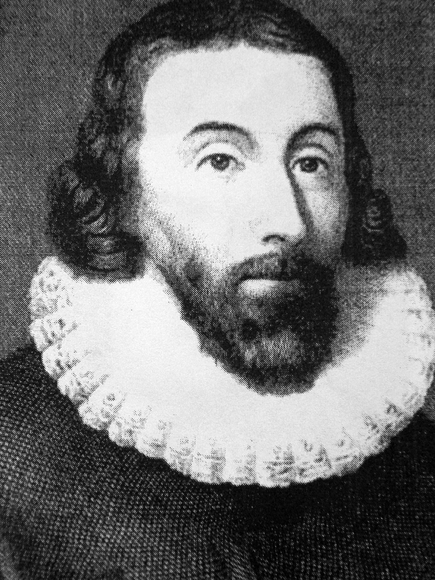 John Winthrop was born in Edwardstone, England in 1587. He would enter into Trinity College, in Cambridge, at age 15, and then marry for the first time at age 17. Shortly afterward he had the first of his 16 children by 4 wives. John would practice law in London from 1613-1629. During this time he served as justice of the peace, held a government job, and he worked as an attorney for the court of Wards and Liveries. Before long, Winthrop was very well off financially. Not long afterward he completely accepted the Puritan faith. King Charles I's policy toward Puritanism cost John an appointment in 1629. The economy of England was in terrible shape, and many people lived in poverty. Winthrop was now very religious, and he believed that he was destined for sainthood. John also believed that his freedom to practice his religion was being restricted. A short time later he heard that the Massachusetts Bay Company had received a charter for a new colony in New England. John sold everything that he had, including his estate. Before the ship sailed the future colonists elected him to become the first governor of the Massachusetts Bay Colony. Winthrop was now in charge of the first great wave of new emigrants to leave England for New England. Prior to this time only the Plymouth Colony settlement existed. Winthrop was joined on the trip by his 2 sons, Stephen and Samuel. They boarded a ship named the Arbella and left Southhampton, England on March 22, 1630. The Arabella reached Salem, Massachusetts 70 days later. Before long, a total of 11 boats left Southhampton with more than 700 people. Winthrop decided that they should move the colony to better location called Shawmut. Eventually, Shawmut became the city of Boston, an important port city and the capital of Massachusetts. Winthrop served as governor of the colony for 12 of the first 20 years of its existence. He believed in sobriety, piety, and service to the community. John also believed in class distinctions. John was deputy governor when a woman named Anne Marbury Hutchinson gained control of the leadership of his church in 1636. Winthrop was so outraged that he led the opposition revolt. As a result, Hutchinson was tried in court for' “traducing the ministers,” and then banished from the church. It was John Winthrop who read the guilty verdict. When she asked him for the reasons for her guilt he replied, “say no more, the court knows wherefore, and is satisfied.” She was then tried again by the Boston church and excommunicated. Afterward, she established a religious colony in Rhode Island. One of John's greatest desires was to spread Puritanism throughout New England. However, the Quakers of Rhode Island would outlast the Puritans. By 1640, John Winthrop was convinced that God favored his community over all of the others. He remained very popular in the colonies throughout his life. His son John Winthrop the Younger became governor of Connecticut. In addition, many of his descendants would hold prominent roles in the slowly forming nation. His book entitled, “A Journal of the Transactions and Occurrences in the Settlement of Massachusetts, 1630-1644,” was first published in 1790. It defines many of his beliefs. It also serves historians with the best detailed historical account of what occurred in early Massachusetts. John Winthrop died after a 6 week fever at the age of 61.